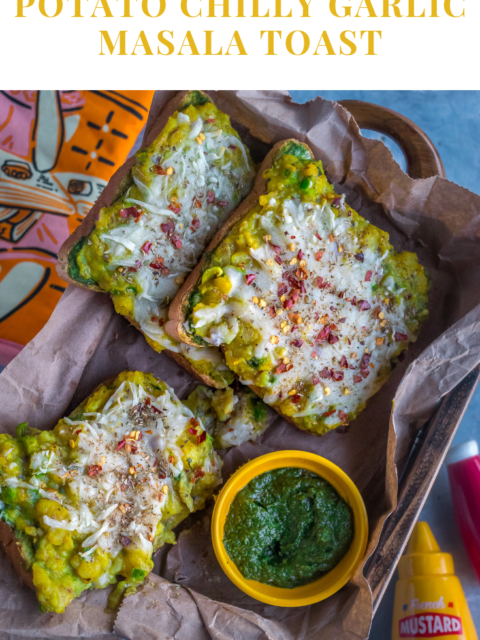 Potato Chilly Garlic Masala Toast is a mouthwatering dish that’s also a popular Mumbai street food. Here is how to make it with step by step photos. Try it today! This shop has been compensated by Idaho® potatoes. All opinions are mine alone. Just the mere mention of Bombay street food makes my mouth water! You must witness the food scene there to believe it! It is C-R-A-Z-Y ! The flavors, the aroma, the sauces, the creativity and the sheer drama that unfolds at nearly every corner of a street in Bombay is definitely worth a visit. Every person you meet here will boast of a local food stall and claim that to be the best one in Mumbai because we Indians are that passionate about food. We take it to heart and love to share it with the world. In fact, there’s a place called ‘Khau Galli’ in Mumbai which literally translates as ‘Food Street’. This place is always inundated with people -street food vendors and customers alike! The oldest memory I have of enjoying street food is with my family. We would accompany our parents to the market every Sunday evening. Our parents would do the groceries and then we would head to a local Chaat place for an evening snack which would eventually become our dinner as we would all end up overeating. Chaat is an Indian term for savory fast food that is typically served up by street vendors. For us, this Chaat place served the best dishes in the world. It would always be filled with people since it was a popular hangout place for many and this vendor whom we all knew on a first name basis would play a wonderful host. Week after week we would throng to his food stall, and after some time it was as though we were all like family to each other. Always smiling and welcoming, he would chit-chat with my dad and discuss business or politics and then he would make my mom try out his new chutney or something else just to get her feedback. My brother and I would be least bothered since we were too busy polishing off the food on our plates. Our orders were mostly fixed. My dad would order a Ragda Pattice, mom and bro would call for Bhelpuri and I would have the Dahi Ragda Puri. Then as a family we would order a plate of Pani Puri and then either finish it off with a tall glass of Lassi or go home and have a bowl of Curd Rice. Once I was done, I would observe people around and that is one habit that has stayed with me ever since. It is like my favorite pastime. Anyway, this is how we spent our Sunday evenings growing up and they are truly some of my most cherished memories with my family. Once I reached my teens, I remember trying to sneak in behind the stall just to see how he would make these dishes and was instantly impressed with his sheer style and zeal with which he managed to feed a group of 20-30 people at a time. 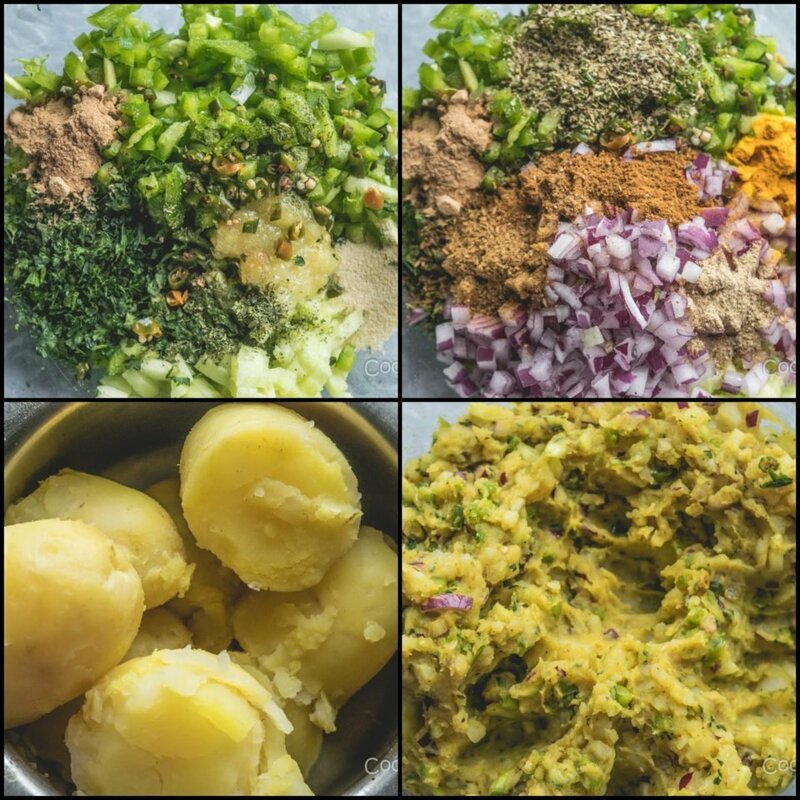 I would notice a few nuances in his process, remember it and use it when recreating those Chaat items at home. I think it was during this time the seed to cook was planted in me. Just watching others cook excited me and made me want to try out different recipes myself. Making street food at home became one of my favorite experiments. Now that we’re talking about how to prepare fast-food items like Chaat at home, I would like to mention that Potatoes are the soul of any Chaat recipe. Chaat is incomplete if potatoes are missing. Therefore, when Idaho Potatoes reached out to me asking to feature their potatoes on my blog, I was sure that I wanted to recreate a popular street food for old times sake! Idaho Russet Potatoes are ideal for Indian cooking and that is what I use in my cooking also. Today’s recipe is my take on a dish served by a popular fast food joint. Its called Meghna Sher Sangham. 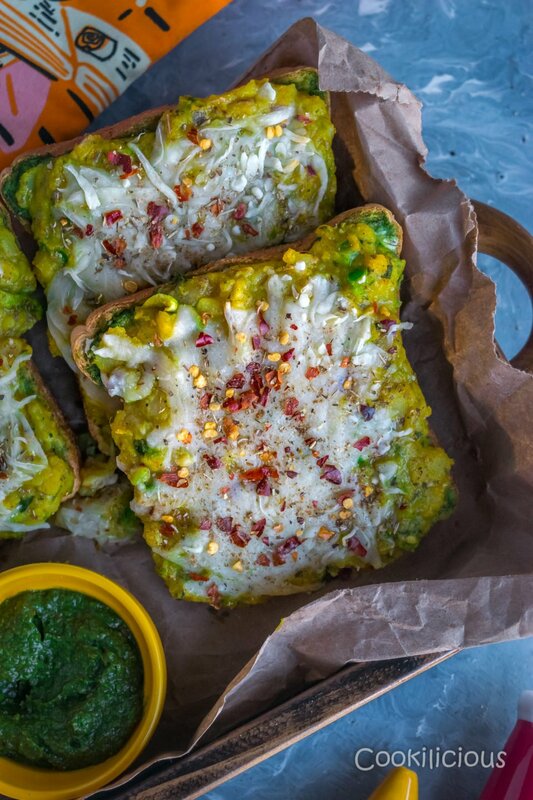 This dish is basically an open-sandwich style Cheese Chilly Garlic Masala Toast. My college was around this area and that is when I got to taste this delicious dish. This is my version of this popular street food and I hope you like it as much as I did! First step is to make the Masala base. In a mixing bowl, add chopped/grated cucumber. Squeeze the water out from the Cucumbers if you wish. Then add some chopped bell peppers, chopped parsley, minced green chillies, ginger paste, onion powder, garlic powder, chopped onions, oregano/mixed herbs, roasted cumin powder, turmeric powder, Garam Masala and salt. Give it all a good mix. Boil/pressure cook Idaho Potatoes in salt + turmeric water. Peel the skin and mash them. Tip – Always mash the potatoes when they are hot. It’s harder to mash them once they get cold. Add the mashed potatoes to the mixing bowl and mix everything together. You can check the seasonings and adjust as per your taste. Preheat the oven at 400 degrees F. Take bread slices and spread any or all of the following items – garlic spread, green chutney, hummus. I have used all of these to give more flavor. Spread some of the mashed potato mixture all over the bread slice. Please be generous in adding the potato mixture. Sprinkle Sandwich Masala (which you can get at your local Indian store) and (lots of) grated Mozzarella cheese. Now we need to toast the bread. For that we need to bake it in the oven for 5-7 minutes or until the cheese on top melts. Take it out and garnish with red pepper flakes and Oregano. Serve Potato Chilly Garlic Masala Toast hot with some ketchup and chutney. Trust me when I say that this snack is mouth-watering and appetizing. 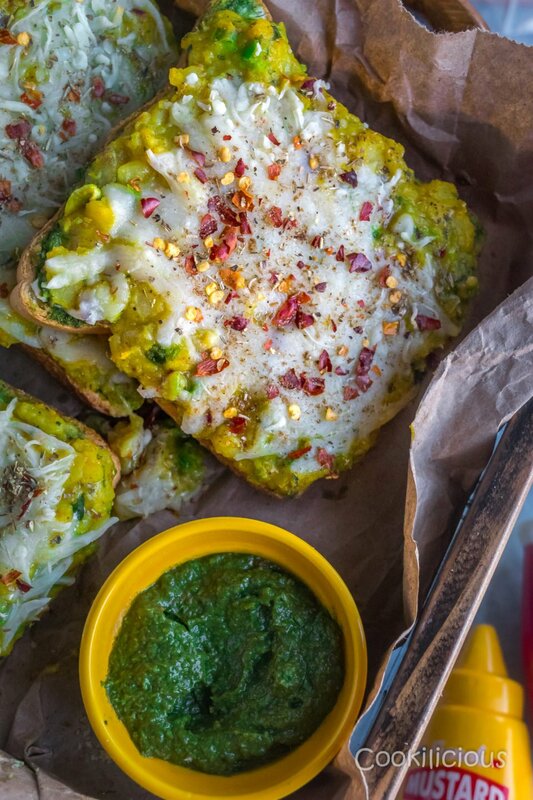 Potato Chilly Garlic Masala Toast is a perfect accompaniment to your evening tea/coffee. It’s cheesy, spicy and delicious. No wonder the food stall that serves this is always crowded and no one wants to leave! If you love to travel, I urge you to visit Mumbai and check out the food scene there. In fact there are many food-travel based shows on Netflix and all of them have covered Mumbai for its vast varieties of street foods. It’s truly a food lover’s paradise where every other minute a new discovery is being made on the streets that could put big restaurants to shame. KR and I relished this snack at home as we reminisced about our growing up years and talked at length about the different foods we enjoyed growing up. In fact, whenever we visit India, we make a pit stop at all those food joints for old time’s sake. I am sure many of you will relate to this emotion. Such is the power of food! Do you have a travel story? What does street food mean to you? Leave me a comment below and share your food stories with me. 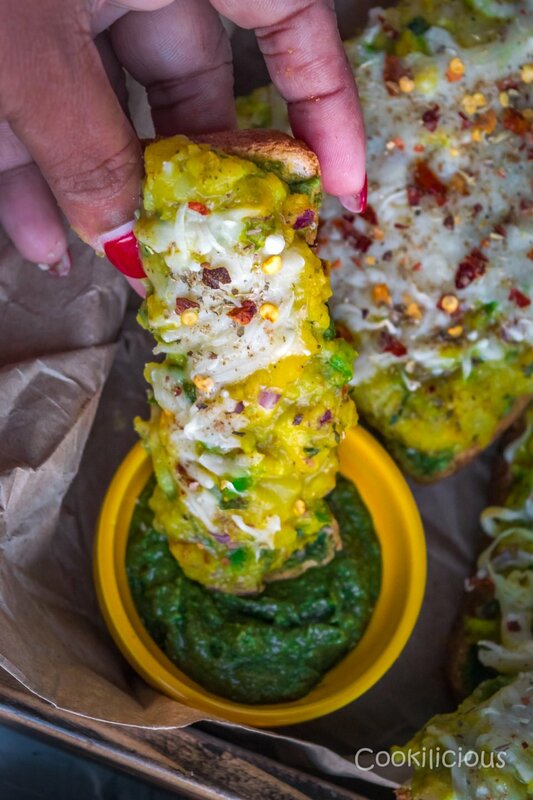 Potato Chilly Garlic Masala Toast is a mouthwatering dish that's also a popular Mumbai street food. Here is how to make it with step by step photos. Try it today! First step is to make the Masala base. In a mixing bowl, add chopped/grated cucumber. Squeeze the water out from the Cucumbers if you wish. Then add some chopped bell peppers, chopped parsley, minced green chillies, ginger paste, onion powder, garlic powder, chopped onions, oregano/mixed herbs, roasted cumin powder, turmeric powder, Garam Masala and salt. Give it all a good mix. Boil/pressure cook Idaho Potatoes in salt + turmeric water. Peel the skin and mash them. Tip - Always mash the potatoes when they are hot. It's harder to mash them once they get cold. Add the mashed potatoes to the mixing bowl and mix everything together. You can check the seasonings and adjust as per your taste. 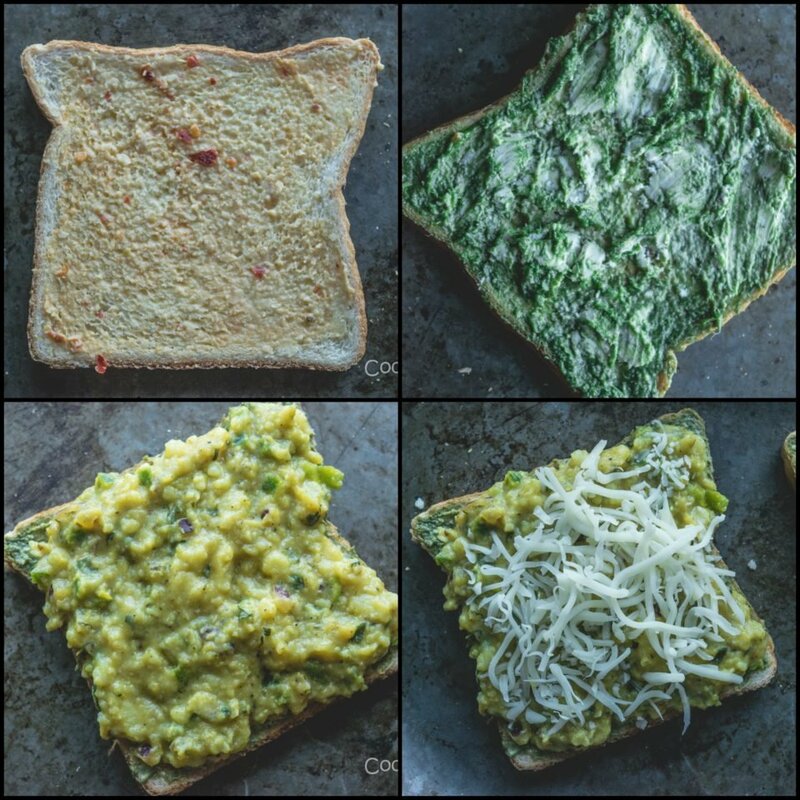 Preheat the oven at 400 degrees F. Take bread slices and spread any or all of the following items - garlic spread, green chutney, hummus. I have used all of these to give more flavor. Spread some of the mashed potato mixture all over the bread slice. Please be generous in adding the potato mixture. Sprinkle Sandwich Masala (which you can get at your local Indian store) and (lots of) grated Mozzarella cheese. Now we need to toast the bread. For that we need to bake it in the oven for 5-7 minutes or until the cheese on top melts. Take it out and garnish with red pepper flakes and Oregano. Serve Potato Chilly Garlic Masala Toast hot with some ketchup and chutney. 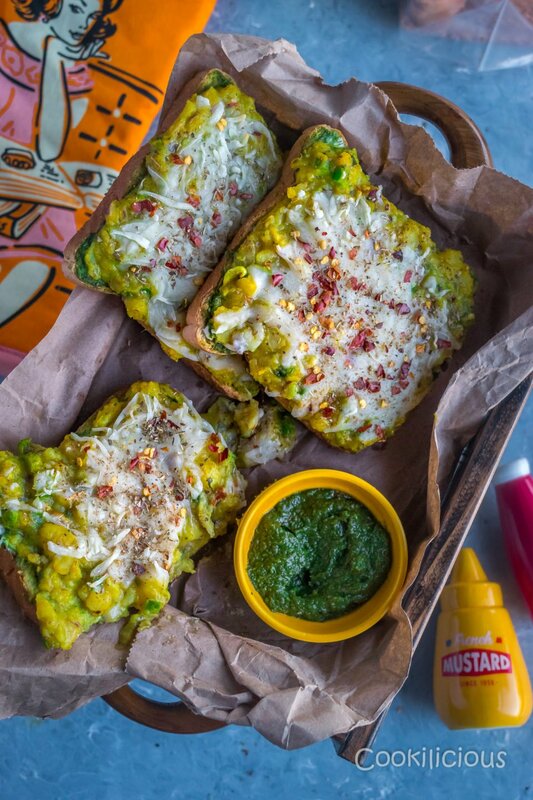 Sandwich or toast makes a great snack and here are some other sandwich ideas that you can try – Bombay Style Veg Masala Toast Sandwich, Sev Puri Grill Sandwich, Deconstructed Masoor Dal Cutlet Sandwich, Potato Capsicum Grill Sandwich, Beetroot cutlets sandwich, Open Faced Yam Burger with Hummus Sauce and Mushroom Jalapeno Burger Pizza. Chutneys that will taste great with these sandwiches are Vegan Onion & Bell Pepper Chutney Recipe, Vegan Spinach & Peanut Chutney | Side Dish for Idli Dosa, Green Chutney using Scallions, Bell Pepper Chutney/Dip and Coriander Mint Chutney. This dish is exactly why I love discovering cusine from elsewhere in the world! I would never have thought of putting anything like this on toast, and it look like it has so much flavour! Yum! This is a unique recipe. I haven’t come across this idea before at all. 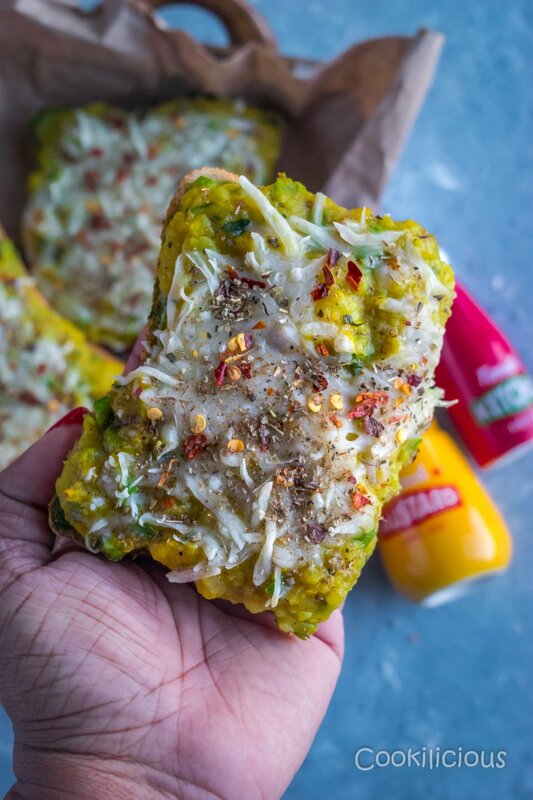 I can see how this brings street food to life in your kitchen. I am going to try the recipe! I’m a big Idaho potato fan and this is one of the most creative ways I’ve seen potatoes used lately. This is a beautiful dish and I love all of the warm spices. This is something I haven’t tried!! Can’t wait to!